Using very long baseline interferometry (VLBI), astronomers have investigated the magnetic field topology of the blazar 3C 279, uncovering the presence of multiple gamma-ray emission regions in this source. The discovery was presented May 11 in a paper published on arXiv.org. NASA's Fermi Gamma-ray Space Telescope is an essential instrument for blazar studies. The spacecraft is equipped with in the Large Area Telescope (LAT), which allows it to detect photons with energy from about 20 million to about 300 billion electronvolts. So far, Fermi has discovered more than 1,600 blazars. A team of astronomers led by Bindu Rani of NASA's Goddard Space Flight Center has analyzed the data provided by LAT and by the U.S.-based Very Long Baseline Array (VLBA) to investigate the blazar 3C 279. The studied object, located in the constellation Virgo. It is one of the brightest and most variable sources in the gamma-ray sky monitored by Fermi. The data allowed Rani's team to uncover more insight into the nature of gamma-ray emission from this blazar. "Using high-frequency radio interferometry (VLBI) polarization imaging, we could probe the magnetic field topology of the compact high-energy emission regions in blazars. A case study for the blazar 3C 279 reveals the presence of multiple gamma-ray emission regions," the researchers wrote in the paper. Six gamma-ray flares were observed in 3C 279 between November 2013 and August 2014. The researchers also investigated the morphological changes in the blazar's jet. The team found that ejection of a new component (designated NC2) during the first three gamma-ray flares suggests the VLBI core as the possible site of the high-energy emission. Furthermore, a delay between the last three flares and the ejection of a new component (NC3) indicates that high-energy emission in this case is located upstream of the 43 GHz core (closer to the blazar's black hole). "The Fermi mission will continue observing the GeV sky at least for next couple of years. The TeV missions are on their way to probe the most energetic part of the electromagnetic spectrum. High-energy polarization observations (AMEGO, IXPE, etc.) will be of extreme importance in understanding the high-energy dissipation mechanisms," the researchers concluded. Ever since the discovery by the Fermi mission that active galactic nuclei (AGN) produce copious amounts of high-energy emission, its origin has remained elusive. Using high-frequency radio interferometry (VLBI) polarization imaging, we could probe the magnetic field topology of the compact high-energy emission regions in blazars. 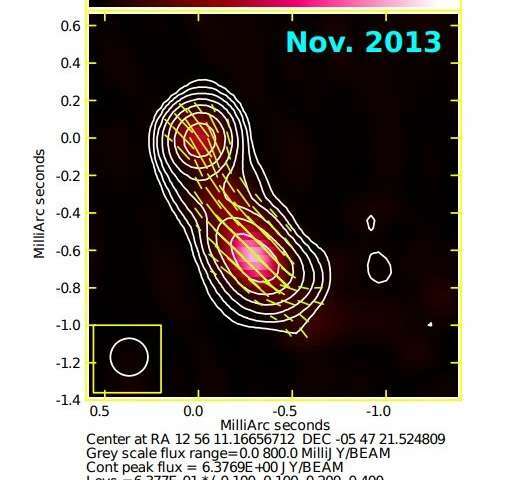 A case study for the blazar 3C 279 reveals the presence of multiple gamma-ray emission regions. Pass 8 Fermi-Large Area Telescope (LAT) data are used to investigate the flux variations in the GeV regime; six gamma-ray flares were observed in the source during November 2013 to August 2014. We use the 43 GHz VLBI data to study the morphological changes in the jet. Ejection of a new component (NC2) during the first three gamma-ray flares suggests the VLBI core as the possible site of the high-energy emission. A delay between the last three flares and the ejection of a new component (NC3) indicates that high-energy emission in this case is located upstream of the 43 GHz core (closer to the black hole).